These student materials complement the Water Science and Society Instructor Materials. If you would like your students to have access to the student materials, we suggest you either point them at the Student Version which omits the framing pages with information designed for faculty (and this box). Or you can download these pages in several formats that you can include in your course website or local Learning Managment System. Learn more about using, modifying, and sharing InTeGrate teaching materials. Some contaminants produce no health effects until a threshold concentration is exceeded. Nitrate (NO3) is an example of this; OK at 50 mg/liter (50 ppm), but at higher levels it produces methaemoglobinaemia (e.g., "blue baby" syndrome). A second group of contaminants has no apparent threshold for health effects. These include genotoxic substances. These include some natural and synthetic organic compounds, microorganic compounds, some pesticides, and arsenic (see below) for example. A third group consists of elements essential to the human diet: fluoride, iodine, and selenium are good examples—their absence in diet causes problems, but an excess of intake can create problems. 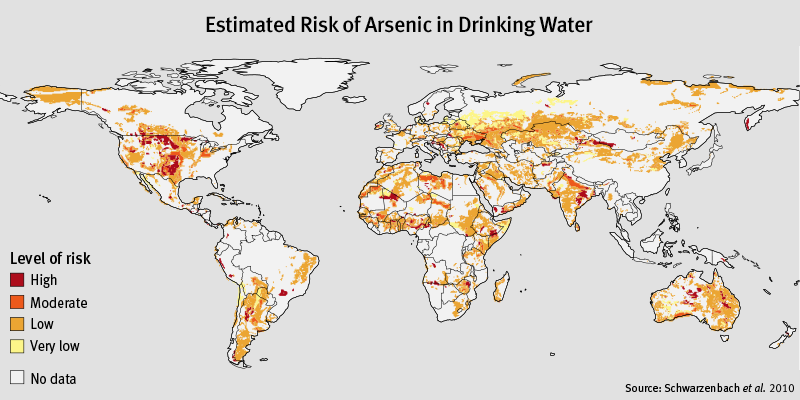 Arsenic is a good example of both natural and human-induced contamination, and it is important as well because of its toxicity at higher concentrations (as are lead and fluoride). In recognition of the potential toxicity of arsenic (As), the US EPA lowered the MCL in drinking water from 50 ppb to 10 ppb in 2001. For example, check out this short video on possible health effects of arsenic and the need to have private wells tested. In New England, groundwater As levels are particularly high (see Fig. 6) as a natural source. In this case, more alkaline (high pH), low dissolved oxygen groundwaters favor high solubility of arsenic in shallow aquifers of glacial origin. Other aquifers with high As concentrations originate because of the type of bed rock. Contamination of aquifers can also occur from agricultural runoff, runoff from arsenic-bearing wood preservatives, improper disposal of chemicals containing As, and/or mining activities. See this article in The New York Times, The Arsenic in Our Drinking Water, for a summary of possible health effects in the U.S. and Bangladesh. Figure 2. A map of the US showing available data on arsenic concentrations (μg/L or ppb) as of 2001 from samples of groundwater. Note that orange or red dots denote concentrations higher than that allowed in drinking water by US EPA regulations. Global maps of the probability of arsenic concentrations in groundwater greater than 10 ppb can be viewed at Global fluoride and arsenic contamination of water mapped, and is based on research by M Amini et al (Environ. Sci. Technol., 2008, DOI:10.1021/es702859e. A more generalized map of risk for As in drinking water can be seen in Figure 3. Figure 3. Modeled risk of As in drinking water at significant levels from Schwarzenbach et al., 2010. Section 1: Fresh Water: Scarcity or Surfeit?